This award fleshed out the horse motif, and used wire, aluminum tubing and black vinyl drawer liners from ACE Hardware, along with some cardboard and hot glue to create the base, and a chunk of Sculpey clay to add some heft. I liked this look a lot, but it was more of a sculpture than an award. The amount of hand labor involved made it impractical to manufacture large quantities of, so we decided not to move forward with this design. This prototype fleshed out the tree motif, and was made from bent sheet metal and vinyl stickers. In addition to feeling a bit generic, the award also seemed like a safety hazard. It didn't make the cut. 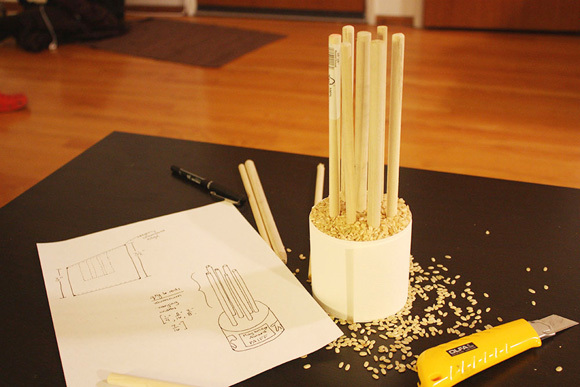 After a brief meeting with PAIFF, this lovely rice-paper-and-dowel prototype emerged as the winner. The design is an abstract representation of the El Palo Alto, and was Travis' contribution to the mix. The designer in me liked its iconic nature, and the mechanical engineer in me liked how simple it would be to manufacture... or would be if I actually had access to any sort of CNC mills. Now that the design was decided, there was just the small problem of figuring out how to have 12 awards manufactured with essentially no budget and only a month of time. I called the Proto-Quick team to describe the project and our nonexistent budget. 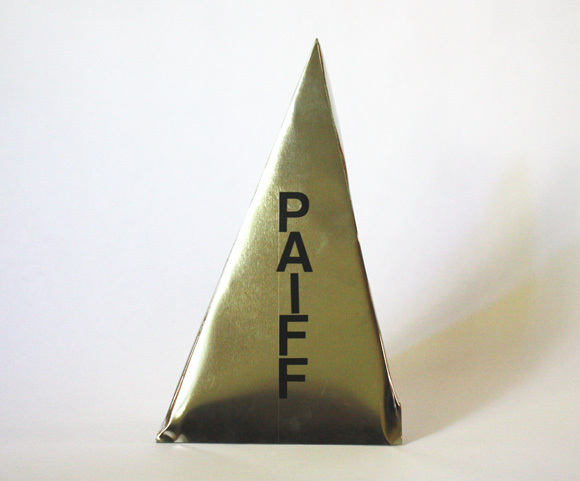 They were excited about the award, so Art Director Kaitlin Sullivan quickly put together a sponsorship package as compensation for their contributions to the festival. I sent a quick sketch to the team, including the materials and finishes I wanted, and the rough dimensions that Kaitlin and I liked. We also arranged a visit to Proto-Quick. We went back and forth with the Proto-Quick guys on CAD mockups, and were impressed by how responsive they were. While Proto-Quick was busy finishing the raw awards, Kaitlin and I spec'd out the colors at Arnold's Metal Finishing (Black bead blast for the rods and polished Bordeau Red for the base) and called around to every laser etching place in the area until we found one that could handle our parts. It was a bit nerve-wracking at times, and there were definitely moments when we thought we'd have to resort to stickers or some other compromise, but in the end we were able to get the awards done just the way we wanted. Kaitlin finalized the vector artwork and sent the files off to Laser Impressions for the finishing work. She also worked with the various vendors to make sure all of the pieces were picked up and delivered at the appropriate times, and the awards were finalized and delivered by the first day of the festival - phew!